Most of us have warm and fuzzy memories of being nursed back to health by a loving caregiver, usually Mom, who served us a cup or bowl of soup. And you parents reading this are sure to have equally warm memories — some pretty recent — but from the other side of the covers. I’d be willing to bet that most of us were served soup made with a chicken-based stock or broth. What went into that broth, however, varied widely from house to house. In ours, Mom used either of 2 pastas, one of which is today’s recipe, quadretti. Generally speaking, Mom relied upon 3 dishes to get me up-and-about. Breakfast would be a 3-minute egg, with or without buttered toast depending upon my stomach’s attitude. My meals would be pasta in bianco. Aside from it being a traditional cure served to bambini with stomach ailments, Mom knew that I could’ve been at Death’s door and I would have agreed to at least try a little pasta in bianco. Between meals, though, there was a constant supply of broth which, as the recovery progressed, contained more and more pastina. Ask my Sister what Mom served her when ill and she’ll mention, without hesitation, Acini de Pepe, a tiny bead-like pasta. As for my Brother and me, it was quadretti all the way. 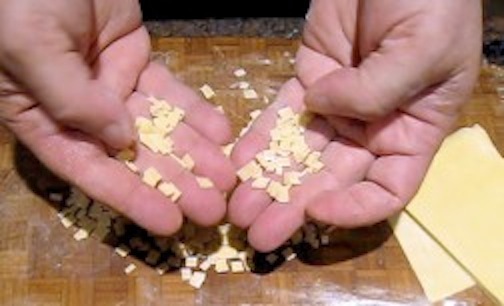 Quadretti are square-shaped pastina that, as you’ll soon see, are quite easy to make. Whenever Mom made pasta of any kind, she would roll out the left-over dough and use it to make quadretti. (In true Italian tradition, absolutely nothing was wasted.) This she stored in a container, adding to it with each new batch of home-made pasta. Because she was always adding to her stash, she rarely had to devote a batch of pasta dough to making quadretti. When combined with the quart or 2 of chicken stock she was sure to have on-hand for risotto, Mom was always prepared when one of us was feeling under the weather. One more thing before getting to the directions and this is for soup novices. You will get better results if you only make enough soup with quadretti for as many bowls as will be served in 1 meal. If you make a large batch of soup with quadretti and store it in the fridge, when you bring it out of the fridge, you may be surprised to find that the noodles have absorbed a great deal of the broth. Not only that but, depending upon how much quadretti you put into the soup, you my have very little broth left at all. So, before you add the quadretti to your soup, take into consideration that the noodles will swell a bit during cooking and later in storage. Better to make just enough soup for one meal and store the raw quadretti separately from the broth/stock. Don’t let any of this deter you from making this pasta. Just as you cannot compare a dish of home-made linguine with store-bought, you will not find a mass-produced pasta that comes close to the taste of home-made quadretti. It just ain’t gonna happen! A half batch of Mom’s Pasta Dough will give you about 2/3 to 3/4 lb of fresh pasta dough. That should be more than enough for most soup recipes. Once the dough has rested, you must roll it out, either manually or by machine. 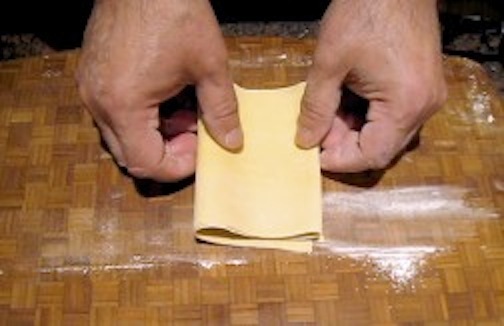 If doing it by hand, roll it until it is as thin as you would when making ravioli. If using a machine that, like mine is at its widest when the setting is number “1,” then pass the dough through the rollers, repeatedly, advancing the setting with each pass, up-to-and-including the number “6” setting. If your rollers, like Zia’s, work the opposite of mine and their widest setting is number “10,” then pass the dough repeatedly through the rollers, decreasing the setting with each pass, down-to-and-including the number “5” setting. Once you’ve attained the proper thickness, cut the dough strip into sheets 2 to 3 feet long, and follow the steps outlined in the images below. Be sure to allow the dough sheets to dry sufficiently. If the sheets are too moist, the quadretti will stick together when you cut them. If too dry, the dough sheet will crack and break as you try to fold it to create the sfoglia. Continue to fold in half repeatedly until a sfoglia of about 2 to 4 inches wide is created. 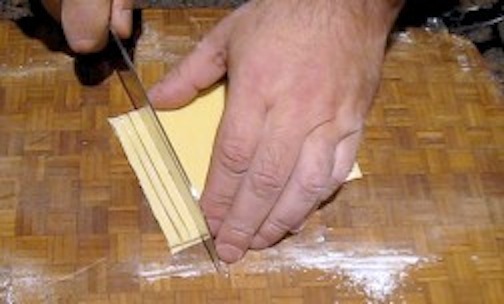 Starting at one end, begin cutting sfoglia into strips, no thicker than the width of linguine. 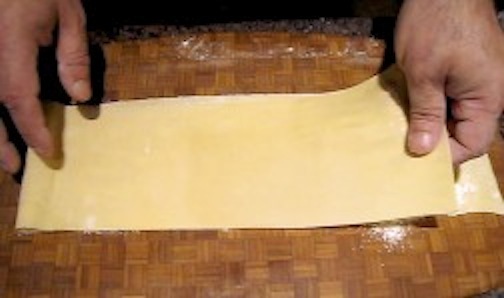 Carefully turn a number of the noodles 90* and begin cutting, again as if cutting linguine. Gently separate the freshly cut quadretti. Spread out to dry before freezing or refrigerating in an airtight container until use. See? A pasta cannot be easier to make by hand and, if you’ve never enjoyed home-made pasta in your broth, you’re in for a real treat. Keep a container of quadretti in the back of your freezer and if, heaven forbid, you’re feeling under the weather, a mug of your home-made broth with a sprinkling of quadretti is just what my “Doctor Mom” would have ordered. This entry was posted in Family Recipes, Home-Made Pastas, Make It Yourself, Pasta/Rice/Soups (Primi Piatti), Vegetarian and tagged family recipes, Italian, Pasta, Recipes by ChgoJohn. Bookmark the permalink. Your Quadretti looks like just the thing to bring a sick child – or adult – back from death’s door! I will definitely make some – although not all may make it into the freezer! I’ve never heard of the Fairy Hobmother, but she sounds like a wonderful gal! The heirloom tomato soup recipe sounds like something we’d like – I’ll have to visit that post next! I won’t speak for the others but quadretti sure did work for me! Even today, at the first sign of a cold or flu, I’ll put up a pot of stock and make a batch of dough, for both pasta and quadretti. 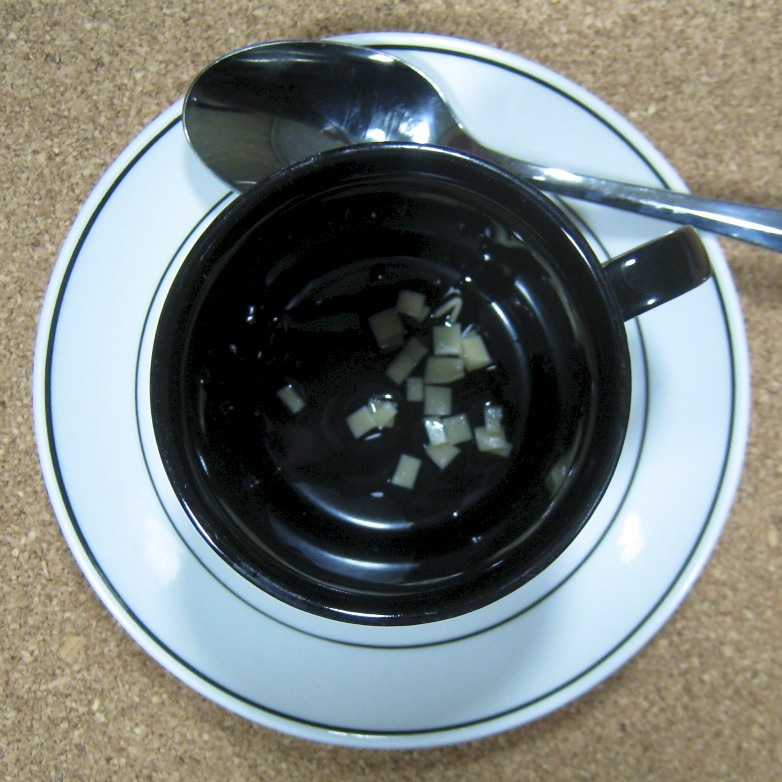 This is one cup of soup that comes with a bunch of memories. Love the “no waste” attitude, and the fact that it was used to nurse you back to health is a bonus! Great tip about making only enough for one meal. I’ve pulled chicken noodle soup out of the fridge only to find bloated (albeit still delicious) noodles and no broth! I think we’ve all gone down that path, putting a healthy container of soup in the fridge, only to retrieve a container of pasta. You’re right, it still tastes great. It just leaves something to be desired as far as soups are concerned. 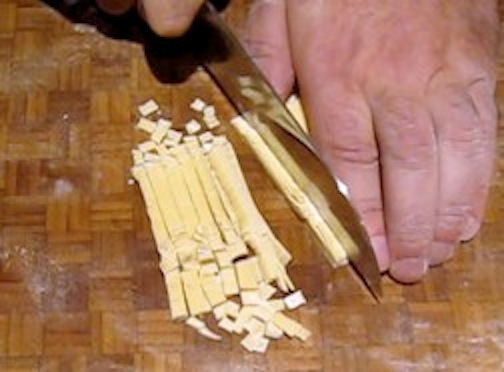 Thanks for re-posting your basic pasta recipe and for showing hand-rolled and cut pasta. I don’t have a pasta machine (or a food processor!) but I do have a rolling pin and now I will be able to experiment with your pasta recipe. When I took up the violin (in my thirties) I picked it up fairly quickly and had good intonation (the hardest thing for many players). Then I stopped playing — but I am not likely to stop eating! WOW! You learned the violin as an adult?!?! My hat’s off to you! Re: the violin. Well, yeah — I’m a folk musician: I mainly played simple waltzes and “fills” for songs. I couldn’t play Bach or anything. The fact that you didn’t play Bach doesn’t make you’re learning the violin as an adult any less incredible. I am very impressed. I bet you make a great pot of soup, Celi, no doubt about it. I’m working on Mom’s recipe but need pics to go with it. This time of year, Mom made a big pot of stock every Sunday morning. For lunch that day, we’d often have quadretti, sometimes with a sandwich on the side. So there’s no need to fake an illness. I hope you do make some. Home-made pasta in soup can’t be beat. A black eye qualifies you for as many bowls as you like, Tanya. Mom didn’t stir egg into this soup. That she reserved for her Stracciatella . I always though pasta in bianco was a “treatment” peculiar to my house. It wasn’t until I was much older that I learned that it was a very common dish served to little ones with stomach ailments. Both dishes, quadretti & pasta in bianco, were favorites when I was a child and remain so today. I rarely get sick so I’m just going to have to either fake it or make it simply for comforting…which I do need! This is wonderful, my mother did not make her own pasta, at least I had never seen her do it. 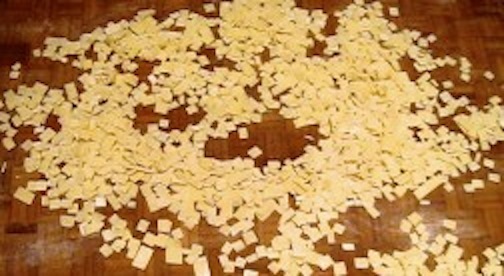 I’ve always felt it takes alot of patience…look at those tiny squares so perfectly cut!! Gnocchi is the closest I get to homemade pasta, but I’d never turn a bowl of this down! Congrats John on your Fairy Hobmother visit!! I hope I meet her one day too!! Pasta making just takes a little practice, Lynda, and as good as you cook, you won’t have any problems. For me, over the past couple years, I use the my standing mixer’s pasta rollers to create the dough strips but, more and more, I cut the dough by hand to make the pasta. By the time I get the machine out, wiped down, set up, and then cleaned and put away, I’ve cut the noodles and it’s well on its way to being dried. Once you’ve made it a couple times, you’ll be a pro, guaranteed! Ah, mom. Nothing like Mother’s touch and her homemade nourishing goodies to make things better when we are sick. Even now. Great post and reminder of all things wonderful about family. Yep. You know you’re officially all grown up when you become ill and you’re no longer living at home. Moms make everything better. And, yes, Geni’s post and blog are wonderful, aren’t they? I’d never heard of quadretti until I read this post, nor of a soup that was just pasta and broth, but it sounds so comforting and makes perfect sense with all that homemade goodness. It’s raining and gloomy here today…I want some! Congrats on your Fairy Hobmother visit…hadn’t heard of her either (guess I’m not getting around enough! ), but you are most deserving! Mom had a few soups that were just pasta and broth and it wasn’t until I was much older that I learned that it wasn’t common. Thank you for your kind words. The Fairy Hobmother assured me she will be back. Maybe she’ll pick your blog as worthy of a gift — I think it is! Good luck! I am so glad you were chosen to receive a Fairy Hobmother gift! I hope you get something you can use in you kitchen. This basic pasta recipe is exactly what I need. I do have a hand crank pasta machine and I just don’t use it often enough. Thanks for the refresher and for the shout out. Thank you, Geni. After all, I received my gift after reading your post — and it was a great post, to boot! And break out the pasta machine! I find I’m using mine more and more. Again, thank YOU! Yeah, judging from the few comments you wrote in your blog, you guys had a rough patch last month and a container of quadretti sure would have been handy! Because it is just pasta and broth, it is very easy on the stomach and nothing soothes a cold better than a mug of Mom’s soup. I was both amazed and surprised that I received the Hobmother’s gift and the timing couldn’t have been better. I hope you’ll soon be saying the same thing. Good luck! Oh I do wish I could have been sick in your home when I was growing up – I would have faked it too to get such lovely home remedies! Oh, I’m sure your Mom had equally effective home-made remedies for you. It’s never so much what is in the cup or bowl but who was serving it. Mom’s make everything better. And I certainly do hope the Fairy Hobmather visits your part of the web. She’ll definitely like what she’ll see. Good luck! Lucky you, John, on so many levels. The homemade noodles would surely bring health back in a jiffy. My mom used to make chicken soup for us without noodles, but as an adult I have grown to love it with noodles. And then there is the Fairy Hobmother visit – congratulations. Do tell, what did you get? Well then, I am doubly glad it was you! You may want to buy a lotto ticket! Ok confession time. You do take confession? I’ve never made fresh pasta. There I’ve siad it. How many Hail Mary’s? Still a little woozy but I’ll make it. 🙂 When you do buy a machine, try to get one that you can remove and replace its cutting rollers. Down the road, you may tire of fettuccine and want some other size noodle. Being able to swap out the cutters gives you that option. Oh that’s so great, congrats. Love the recipe too! Thanks, on both counts. Good luck to you, too! Just a lovely story. The curative properties of simple, honest food are incredible. I’ll remember the caveat of storing the broth with quadretti together. Thanks, Roger. You can’t get much more simple than a broth with some form of pastina but, when served by Mom, it’s a miracle cure. My husband has a cough that he just can’t get rid of, so I’m on the lookout for soothing soups and the like. And I looooove tiny pastas. I will be trying the quadretti! 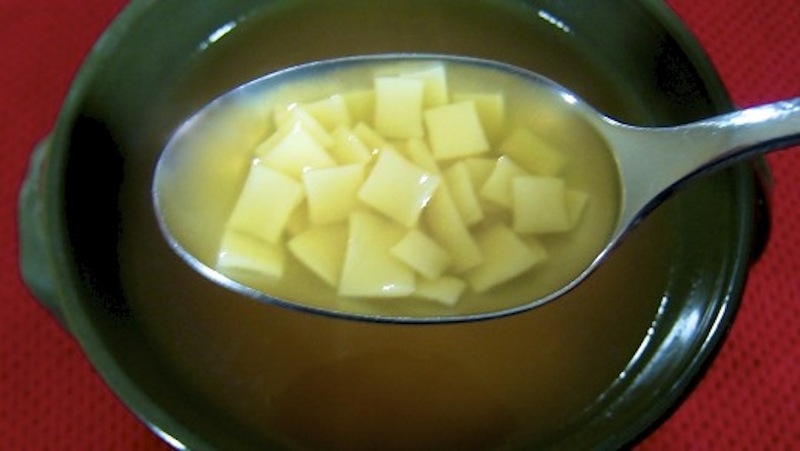 Being so plain, this soup is great for a queasy stomach and, as a child, I loved it. Well, I still do, for that matter. I hope this works for your DH. Thanks for stopping by and taking the time to comment. Is the freezing or refridgeration necessary? I’ve made pasta, dried it, and stored it in airtight containers before. Personally, I’ve stored dry pasta outside of the freezer. Still, this is an egg-based dough and the “rules” for them is to refrigerate or freeze and I will, too, if it’s very warm & humid, just to be on the safe side. Some parts of Italy are known for their pastas made with just water and semolina. These pastas, once dried, have no need for the fridge or freezer. And, yeah, ya gotta love the Fairy Hobmother! Thanks for stopping by and commenting! Quadretti is so easy to make! Thanks to your stepwise instructions, which made understanding the process easier. I really wanted to try out quadretti for quite some time. And yes, congratulations on being the apple of the fairy hobmother’s eyes! Would she look at me too? This soup is similar to the one that Liz makes for me when I’m feeling ill. Obviously this comes from the Italian side of her family. It always makes me feel better. Thanks, Jed. These simple pastas work well when you’re under the weather. They’re easy on the stomach and, like Mom did, you can increase the amount of pasta in the broth as the patient improves. A few years ago, I found the Greek version of quadretti and bought a bag. Instead of satisfying that need (primarily nostalgic) for quadretti in my soup, it only made me want the real thing all the more. That’s when I started making them again. That’s awfully kind of you but I bet your soup was just fine. I don’t know if the quadretti is a cure-all but there was a time when I thought my Mom could. This, for me, is a comfort food like few others. Look at how tiny you cut those noodles! This soup sounds fantastic, and the perfect remedy for that darn cold everyone is getting (I’m still getting over it). Congrats on getting a visit from the fairy!! Thanks, Caroline. Quadretti are really easy to make and you can make them as large as you want, although they are considered a pastina, so, smaller is better. I’m glad you’re on the mend and hope you’ll be back to 100% in no time!. I’ve never had quadretti before, but I love homemade pasta! I’ll have to try them next time! They’re so cute and tiny, they even look and sound like confetti. What’s not fun about that? Def. would at least cheer me up when I’m sick! The best we could hope for growing up was a can of Campbell’s…*sigh*. Can’t wait for you to tell us that you’ve made your first batch of pasta! You’re gonna love it! I think it is wonderful that the fairy hobmother paid you a visit. You are so generous with passing on your family recipes to all of us that she left you a present. There was no tiny little pasta in homemade broth when I was little. Chicken noodle soup straight from the can but as you say it was still given with love. She really was something, wasn’t she? I swear, if I’d live just a few miles further East, she would have jumped on the train with a pot of her soup every time I called her and she detected I had the slightest of sniffles. Thanks, Debra. To say that the Fairy Hobmother surprised me is an understatement! I cannot encourage you enough to try to make your own pasta. There is such a vast difference in taste, versus store-bought, and, once you get the hang of it, it’s not that hard at all to do. If nothing else, start by making dough sheets, give them a quick boil, and use them to make lasagna. If that doesn’t get you hooked on home-made pasta, nothing will. Good luck! wow, I need to try this during the upcoming winter…looks so soothing and comforting….I can almost taste it now as I watch TV under a blanket with warms socks and hot bowl of this goodness. They carry a mass-produced version of quadretti in the Greek market I frequent. I’ve bought some, on occasion, but all it does is make me want the “real thing” more. There’s just no substitute for home-made. What a great post! I think we would be much healthier all over the world if we ate and cured ourselves like the Italians. Thank you. This was a wonderful post to write. It brought back many warm memories of Mom as care giver. Not such a bad way to spend a couple hours, eh? Fairy hobmother? Will have to scoot over and read about that! You have some serious skills there with making and cutting up pasta. Congrats on the gift. Mom made her dough just like your Grandmother for much of my youth, It wasn’t until she got a food processor — and I was well into my teens — that she “modernized.” I have her old rolling pin — its about 3 feet long — and I keep promising myself that one day I’m going to teach myself to make pasta dough like she & your Grandmother did. When it comes to make it, though, I always opt for the quick and easy way. I’m spoiled! And yes, the Fairy Hobmother is great! I hope she picks a number of my commenters, yourself included, of course, for a gift. Thanks for your post. My mum always used to nurse me back to health with a glass of water and a no nonsense attitude. Not so welcome sometimes, but then I was probably faking a lot of the time 🙂 I’d heard of the fairy hobmother before and, being a poor uni student, was entranced by the idea of granting kitchen wishes anonymously over the web! Such a great idea and I’m so glad you got a visit. You only got caught faking once with my Mom — and you never dared try it again. The Fairy Hobmother’s visit was a complete and utter surprise! I hope she has deep pockets so that a great number of people, like yourself, can “get lucky.” Thanks for stopping by and taking the time to comment.